“Attending Ramapo College provided me with the creativity and tools I needed to start my own business. My professors and the courses I took taught me the importance of social media, marketing and creating my own brand. My time at Ramapo helped me find the confidence to create and manage events and courses through my business. 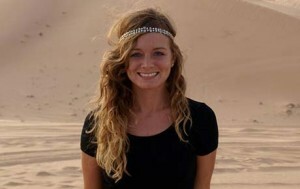 I am now happy to say I am working and traveling on my own, teaching yoga, and leading courses abroad.” – Tina Bock ’10 graduated with a degree in Music Industry and is now a Registered Yoga Instructor living in Abu Dhabi.